Fine tapered works of art. Smoothest bones you ever laid your hands on. Wanted: Recycled or sustainably sourced wood. Adam needs more wood. If you can supply any of the woods below, please contact Adam. 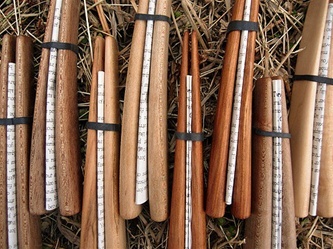 Adam Klein Bones are a combination of fine art, environmental consciousness and functional musical instrument design. These bones are sculpted by an artist who enjoys making musical bones in various shapes and sizes. The wood for his instruments comes from reclaimed, organically grown or sustainably managed timber. The curved tapered bones "have been my standard shape since about 2002," he says. Another factor that sets Adam's hand sculptured musical bones apart from the rest is the care he takes in cutting the wood blank. "I try to get the grain to run parallel to the shape," he reveals. What are tapered bones? Tapered bones are easy to recognize because one end is thinner than the other. Most folks like putting the thin end between their fingers because it's more comfortable that way. But there ain't nothing wrong with playing them with the thick ends between your fingers. Or if you are like me, you might just play them every-which-way. Each bone is signed by hand in a way that lets you know which bone is which - if you know the secret! Mozart was fond of writing backwards. So is Adam Klein. Observant customers will notice the written label at the end of one pair of Adam Klein bones is written from left to right. The other bone's label is written from right to left. In other words, the writing on one bone is normal - the other is backwards. Yes...this might seem a little odd. But after all, Adam is an opera singer by trade, and thus a tad eccentric (as is my mezzo-soprano sister-in-law). However, the left & right writing does serve a practical purpose. Because if you want to know which bone is which - all you have to do is look at the ends. If it matters to you which bone is which, then "you can distinguish them more easily by the different direction of the signatures," says Adam. Here is my recommendation if you want to know which bone is which: Just keep the backward bone closest to your thumb (this is the "anvil" or stationary bone). That way you can read at least one of the bones. Otherwise, if the anvil bone is the normal bone, then you cannot read either bone because the text on one is backward and the other is upside down. Does all this sound confusing? Yes, it does. So some players will notch the bones instead. And other players won't care which bone is which. But in any event, you will own a pair of uniquely hand signed bones with a special secret code. What possessed Adam to label one bone backwards? "The right-to-left signature on one of each pair stems from my being a lefty," explains Adam. "And several years ago," he continues, "I started signing opera posters for donors and such right to left, just to make them think." Well, everyone knows that bone players are extremely intelligent beings. So Adam decided to do the same thing with the bones. And here we are. The design is quite elegant. And the extra fine finish gives your instruments the deepest most opalescent finish I have ever seen on wooden bones. Other bone makers, like myself, sand musical bones to a nice smooth 120 grit finish and call them done. With Adam, however, 120 grit is barely getting started. You would think he might quit when the bones are more than twice as smooth - say, 320 grit? No, Adam does not stop there. He continues to sand them finer. If you were a fly on the wall you would see Adam sanding past 400 grit...then 600 grit...even 800 grit and beyond. In fact, when Adam reaches 1,000 grit (yes, I said one-thousand grit), he is still only half-way done. I know you will find this hard to believe, but your Adam Klein bones are hand sanded to an astonishingly silky smooth 2,000 grit finish. No. After sanding the bones, Adam meticulously signs, dates and labels each one by hand using India ink, fills the ends as needed with crystal clear epoxy resin, then carefully hand rubs the entire surface of each instrument with boiled linseed oil (a natural product made from flax seed). Now they are done. Adam Klein is an eclectic and environmentally conscious person who sings opera, plays and makes banjos, dulcimers and various other stringed things. He also crafts wind instruments, drums, and of course, rhythm bones. "I use recycled and rescued material whenever possible," says the habitatually responsible luthier. Adam also teaches photography, carpentry, woodcrafting, "raw" food and other culinary curiosities including how to make tofu actually taste like something. He has composed two operas: Leithian, based on The Silmarillion by J.R.R. Tolkien; And a children's opera, Goldie Locks And The Three Bears, featuring acoustic tunes and traditional songs. Adam speaks (or sings) several dialects of English and is familiar with French, Italian, German, Russian and some Czech. He is acquiring a working knowledge of Brazilian Portuguese, Tuvan and Japanese and hopes to add Mandinka to the list. He has taught hundreds of people how to play the bones and especially enjoys teaching school children. "Bones are an excellent inroad into the world of musical performance," says Adam, "and a good way to get kids to learn about rhythm because they are so cool."